Expedia Kansas City holiday packages will help you save money! Combining your bookings will give you more cash to splurge for your amazing adventure. Smart travellers who secure a package deal on Expedia will save up to $200*. With more than 400 partner airlines and 321 000 properties to pick from on our comprehensive database, you won't have any trouble crafting your perfect holiday. You can make changes to almost any reservation and you won't pay a cancellation fee to us. It can be enjoyable to just stroll around the streets in a new place, but sometimes it's a good idea to make a plan. Grab your travel schedule — we have loads of fantastic ideas for your Kansas City holiday. With wonders such as the Kansas City Zoo and Crown Centre, there will never be a boring moment in this thrilling metropolis. When you're done having a look at those, squeeze in a little more sightseeing at the Liberty Memorial and the Kemper Museum of Contemporary Art. If you've got a curious spirit, it's worth a trip to Hallmark Visitors Centre. You never know what you'll discover while you're there! Travellers in this destination have an abundance of choice. A wise man once said, "This world is but a canvas to our imagination." 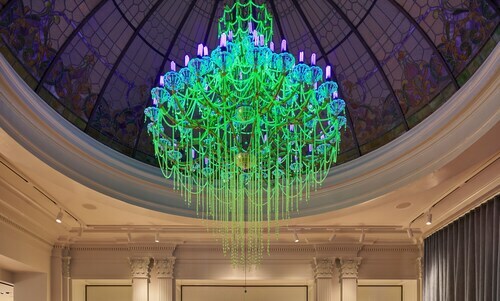 Consider the intriguing works at Nelson-Atkins Museum of Art, and take a couple of minutes to envision the story behind each piece. Still got time to spare? Excited by the majestic marine realm? Encounter amazing animals and discover the mysteries of the planet's waters at Sea Life Aquarium. 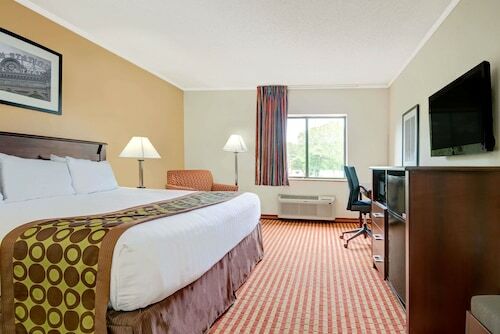 After a big day of exploring in Kansas City, have a rest in one of 48 accommodations. The greatest luxury getaways and cheap holidays are only the beginning at Expedia. If you enjoy living the high life once in a while, why not treat yourself to a night at The Raphael Hotel, Autograph Collection (325 Ward Pkwy) or The Fontaine (901 W. 48th Place)? If you'd prefer to spend your hard-earned cash on things like hair-raising adventures and wild nights out, why not look into a few of our budget options? 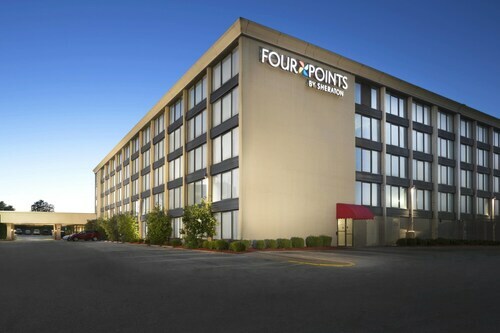 The Hampton Inn Kansas City / Downtown Financial District (801 Walnut Street) and the Sheraton Kansas City Hotel at Crown Centre (2345 McGee Street) are a couple of recommended ones. Pass through the security gate, shuffle onboard, stow your luggage and buckle up! Your well-deserved trip to Kansas City is only a plane ride away. After hitting the tarmac at Kansas City International Airport (MCI), you'll be approximately 18 miles (29 km) from the central area. This city zoo is home to a huge array of animals from the four corners of the globe, and boasts one of the best African exhibits in the country. Missouri's largest free contemporary art museum boasts an array of artworks, representing a variety of different influences, nationalities, genders and ethnicities. This self-producing, top-class performing arts venue is a national treasure. This huge factory gives visitors a unique glimpse into the making of a great American icon. Explore the underwater world of sharks, rays and starfish and watch the feeding shows of sea creatures more than 1,600 kilometres from the sea. From Broadway shows to African animal enclosures and everything in between, Kansas City's biggest park has activities to suit everyone's taste. Casualties of World War I are remembered here at this memorial site which is also home to a comprehensive museum dedicated to “The Great War”. This lovingly restored ship is a treasure trove of 19th-century artefacts from the pre-Civil War Midwest. Shop, dine or sip coffee at an outdoor table in this beautiful Spanish-style shopping area, which is scattered with picturesque statues and fountains. See everything from ballet to pop to Broadway shows in this impressive venue, which is an example of some of Kansas’ most distinctive architecture. Take a step back in time with a visit to this incredible museum that houses a collection of toys from the Victorian era onward. Walk reconstructed trenches and see the personal belongings of soldiers in the extensive collections of this rich and varied museum of wartime events. Experience the wonder of science via hands-on exhibits and experiments at this family-friendly museum set inside a century-old railway station. Wander amid thousands of roses and spot waterfowl in this picturesque park, which is as peaceful and appealing as it is historically significant. 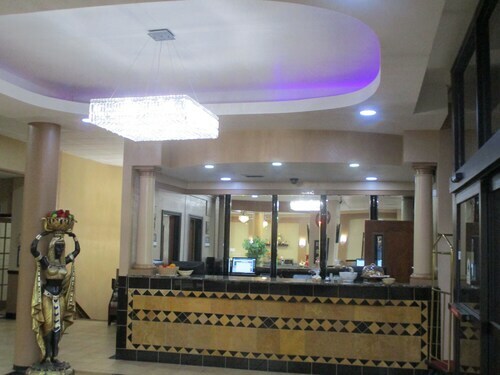 Situated near the airport, this hotel is 1.7 mi (2.8 km) from Harley-Davidson Factory and within 6 mi (10 km) of Tiffany Greens Golf Course and Zona Rosa Shopping Mall. Ladoga Ridge Winery is 13.5 mi (21.7 km) away. Located in Country Club Plaza Area, this luxury hotel is within 1 mi (2 km) of Country Club Plaza, Country Club Plaza, and Nelson-Atkins Museum of Art. University of Missouri-Kansas City is 1.6 mi (2.6 km) away. 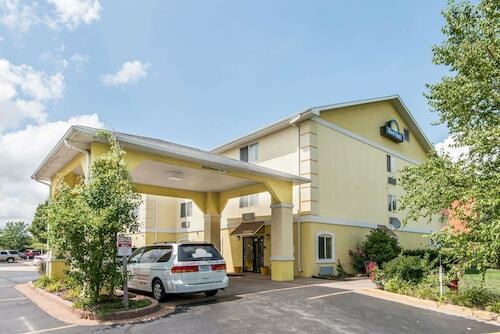 Located adjacent to Kansas City's largest medical facility, Embassy Suites is 1 block from Westport nightlife and 4 blocks from Plaza shopping, restaurants, and art. This hotel offers a complimentary shuttle on event days to Kauffman and Arrowhead Stadiums. The hotel is conveniently connected to these Kansas City stadiums via George Brett Memorial Bridge. Situated near the airport, this hotel is 2.9 mi (4.7 km) from Tiffany Greens Golf Course and 3.7 mi (6 km) from Zona Rosa Shopping Mall. Sprint Center and Worlds of Fun are also within 20 mi (32 km). 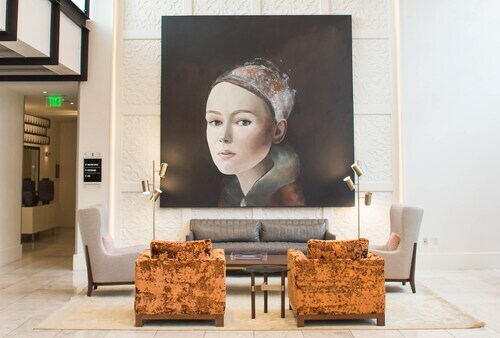 Located in Downtown Kansas City, this historic hotel is within a 10-minute walk of Kansas City Public Library, Power and Light District, and Kansas City Convention Center. Sprint Center and Kansas City City Hall are also within 15 minutes. Situated in Kansas City, this hotel is within 3 mi (5 km) of Harry Wiggins Trolley Track Trail, Swope Park, and Van Noy Mansion. Cave Spring Interpretive Center and Starlight Theatre are also within 6 mi (10 km). 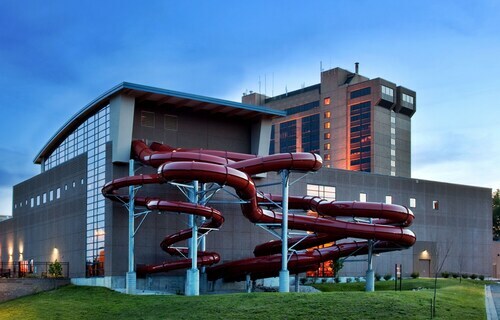 Situated in Kansas City, this hotel is within 2 mi (3 km) of Bay Water Park, Harry S. Truman Farm Home, and International House of Prayer. Glenwood Theatre at Red Bridge and Minor Park Golf Course are also within 6 mi (10 km). Tue., 23 Jul. - Sat., 3 Aug. Thu., 1 Aug. - Wed., 11 Dec. Looking for Flights, Hotels, Car Hire and Holiday Rentals in Kansas City?